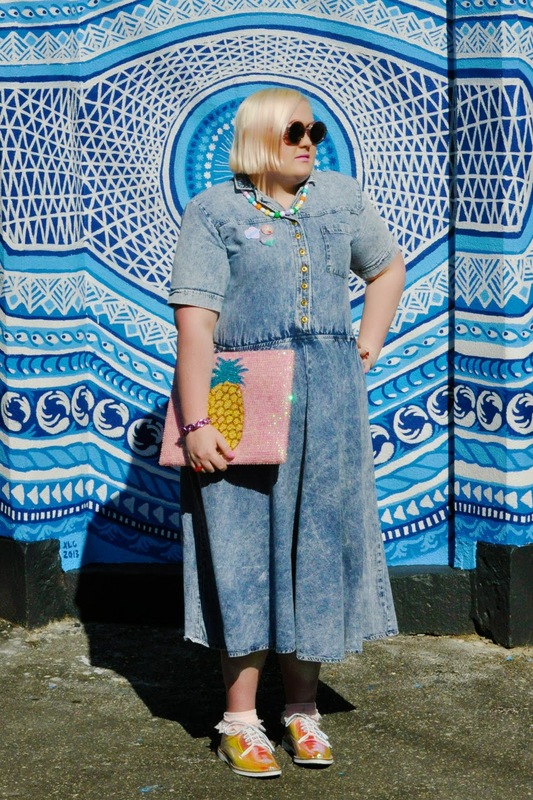 I had been on the hunt for a vintage denim dress for ages when I stumbled across the perfect one at Melbourne plus size vintage store Hey Fatty who had market stall a few weeks back. 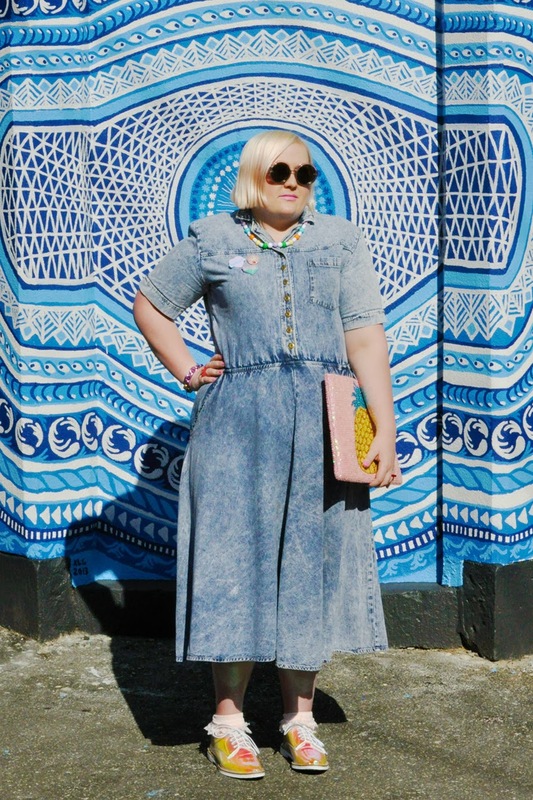 Since then I've practically been living in this acid wash a-line midi length dress. 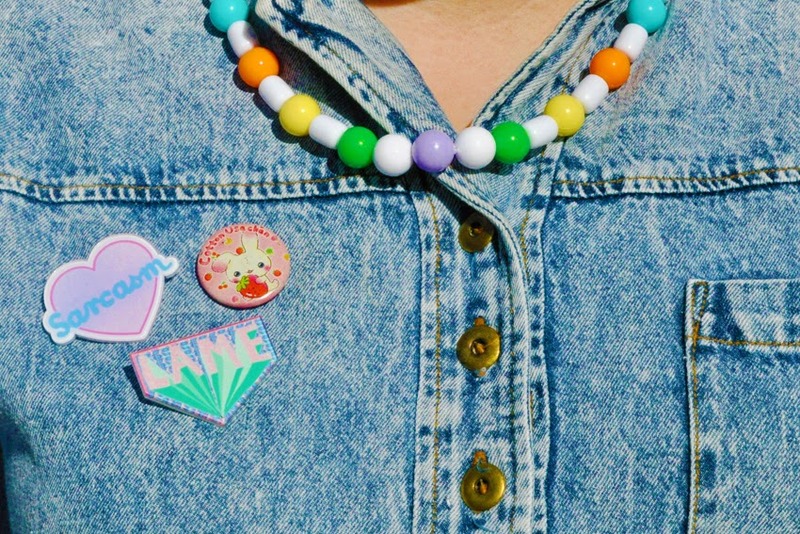 I've styled it so many different ways so far but this look is one of my favourites with it's pastel punky 80s vibes. Generally the only outfits that end up getting shot are what I wear on the weekends as otherwise there's no one around to take photos of me, so it makes it hard to share all my outfits because by the time the weekend rolls around I may be bored of something and more often than not the weather is terrible. But not this past weekend, the weather was great on both days so we were able to shoot two looks in the one weekend - totally unheard of! I wore this out to brunch and a spot of bicycle shopping (guess what colour bike I got?). We snapped the photos at this great new wall of graffiti by Lucas Grogan that popped up in our street recently, watching the piece develop was amazing to witness over the couple of days it took to complete. I was sent an array of amazing Lime Crime cosmetics to review from Makeupnet who are the distributors of Lime Crime in Australia & NZ. 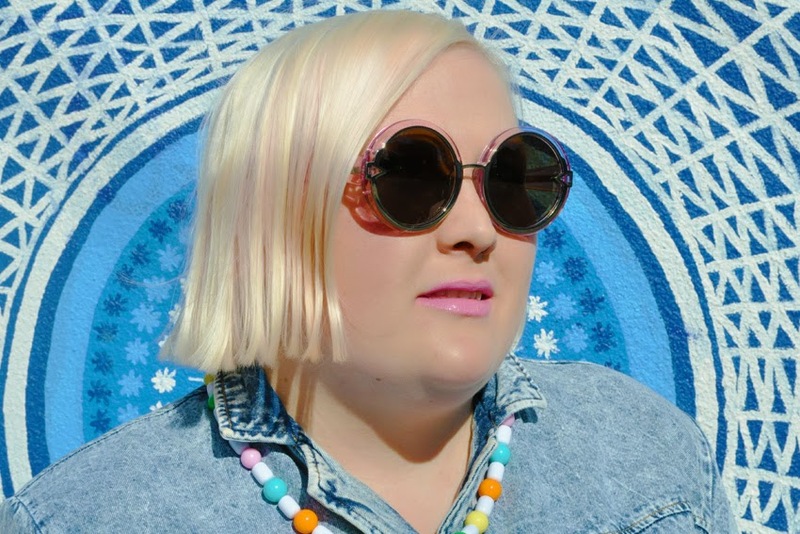 Above I'm wearing Lime Crime's 'Great Pink Planet' lipstick which is a pastel pink shade with a hint of fluoro. As a big fan of Lime Crime lipsticks I am so happy to have this one in my collection after lusting after it for a long time. 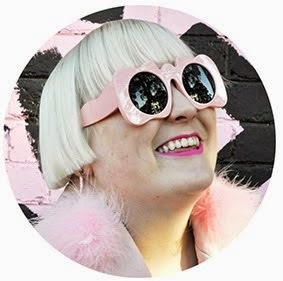 The colour is perfect with my skin tone and I do love all things pastel. I'm not a beauty blogger but I'm thinking of doing a post of swatches from my Lime Crime collection and better detail photos of the product on, would that be something you want to see? Let me know in the comments below. Op-shopping in Adelaide RULES. Can't wait to share with you more from that trip soon. I go through badge wearing stages and have a pretty big collection ranging back from my teen years. 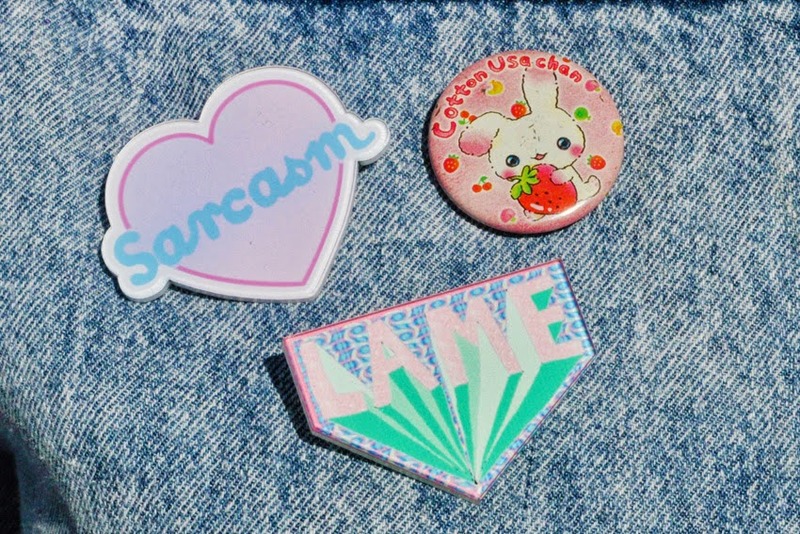 Above the Sarcasm and Lame badges are from Fashondacci and the usagi bunny badge is from Chinatown when I was around 15. Will I ever grow up and stop liking the same things I did when I was younger? I sure hope not! 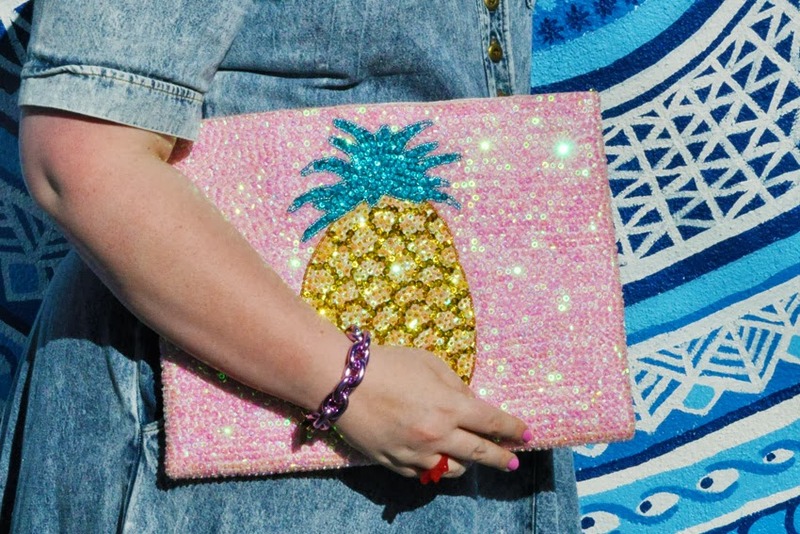 This pineapple clutch is like the best thing to happen to bags since sequins were invented. I love it so much, I have it on display in my room just so I can look at it at all times - that's how much I love it. Say hello to the BEST SHOES to ever exist in the history of shoes. 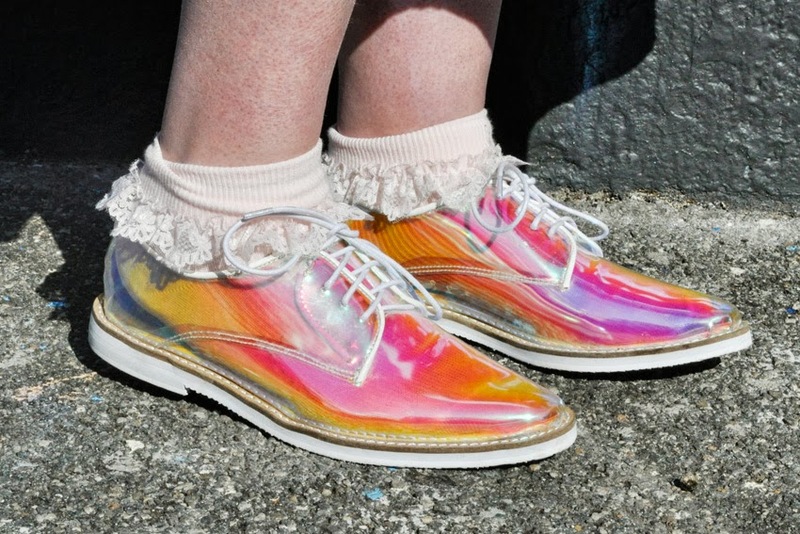 Holographic clear brogues from Fashondacci So much L.O.V.E. for these babies, can't wait to pair them with patterned socks and wear them in Tokyo next month. Are they not online yet? Ohhhh I want them so bad! I LOVE THAT DRESS!!!! I was umming & ahhing about trying that baby on, NOW I WISH I HAD! looks AMAZING!!!!!!!!!! OH MY, that dress looks AMAZING!!! I ummed & ahhhhhhed about that dress, I am now kicking myself that I didn't snap it up! This whole look is spectacular, LOVE it. That dress is awesome!!! Whole outfit is sick! That dress is awesome! Whole outfit is sick!! And your clutch is amazing ! this look is banging! i love the it especially the background of your pics accentuates it all!